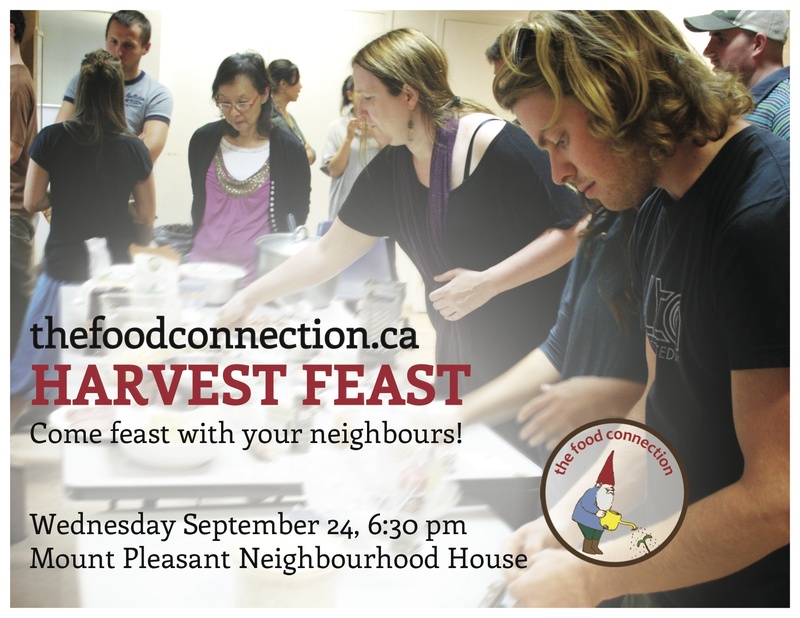 Mount Pleasant Food Network is a proud member of the Vancouver Neighbourhood Food Networks (VNFN). We collaborate with associated food networks across the city to share best practices and advocate for food justice. 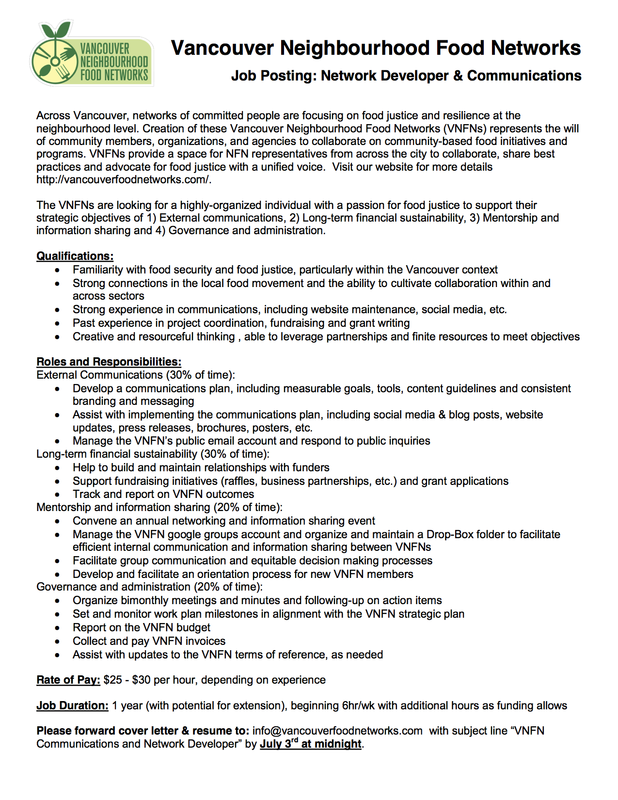 The VNFN is looking for a Network & Communications Developer to help support our work in food justice and resiliency. Apply by Sunday, July 3! 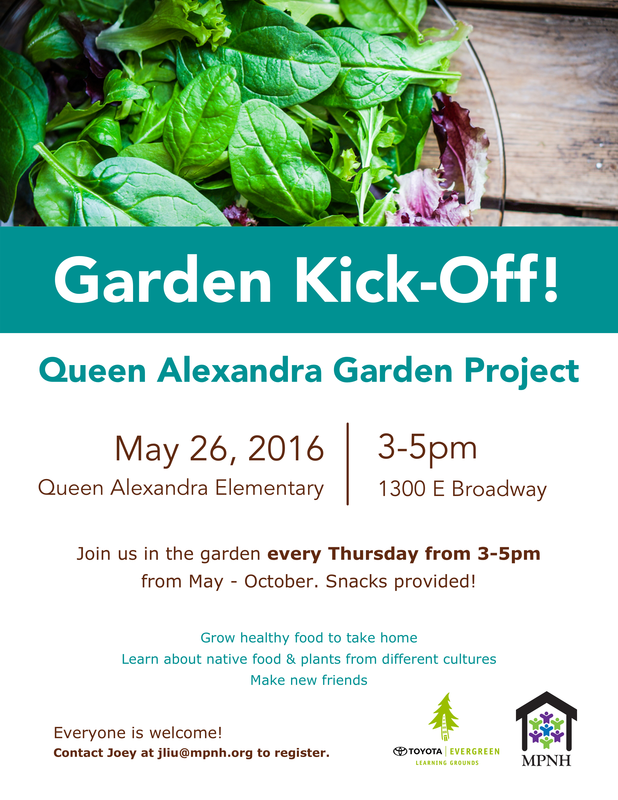 Join us on Thursday, May 26 at Queen Alexandra Elementary for a Garden Project Kickoff! 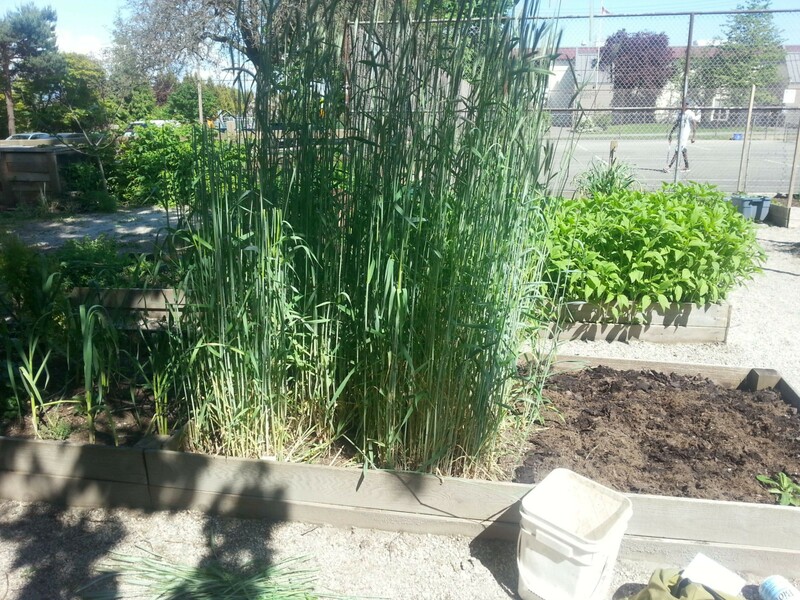 This year Mount Pleasant Neighbourhood House received an Evergreen Learning Grounds grant and Neighbourhood Small Grant to help Queen Alexandra Elementary coordinate their school garden and plant some native plants. 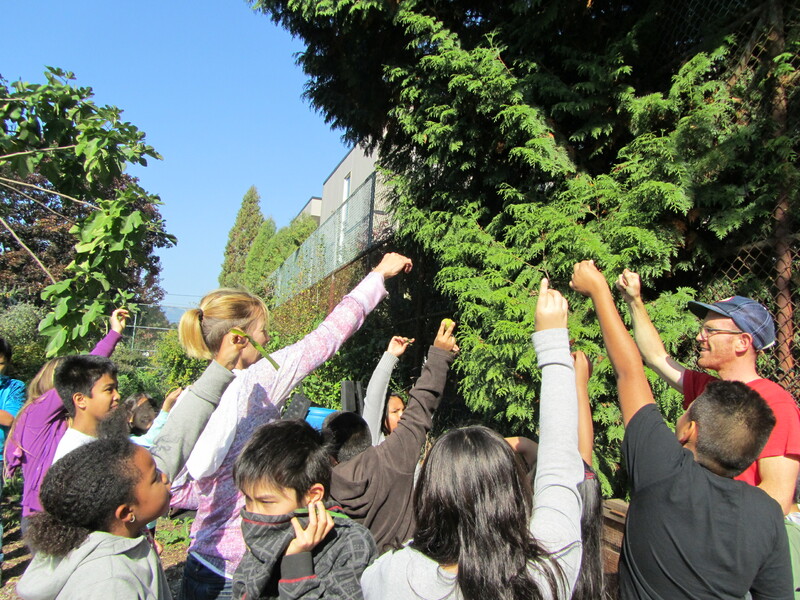 We’ll be hosting garden work parties with the school every Thursday at 3-5pm until October. Learn about native food and plants from different cultures, grow food to take home, and make friends with people in your community! 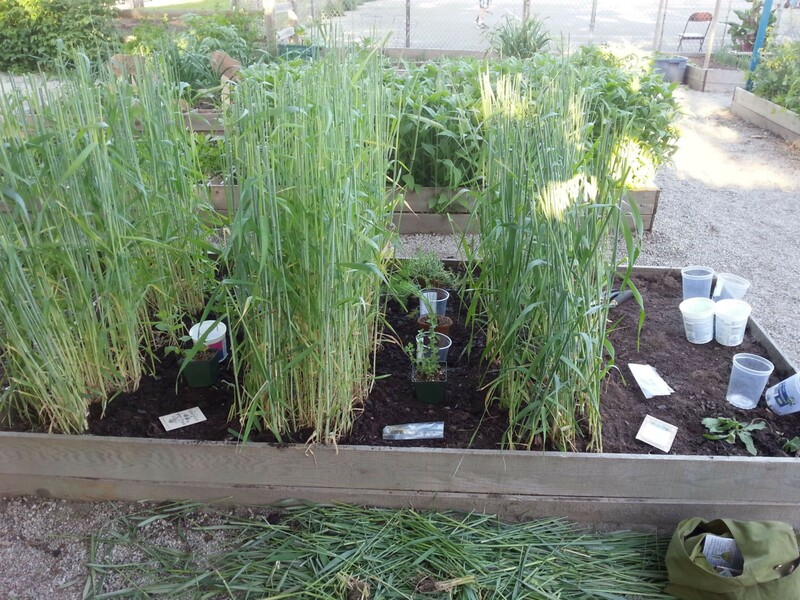 We’ll also be hosting Community Harvest Celebrations in August and October, where you can enjoy native plant workshops by Metis Herbalist Lori Snyder, and help harvest, prepare and eat fresh food from the garden. Everyone is welcome to participate in this garden project. Snacks will be provided. To register or learn more, contact Joey at jliu@mpnh.org. See you in the garden! 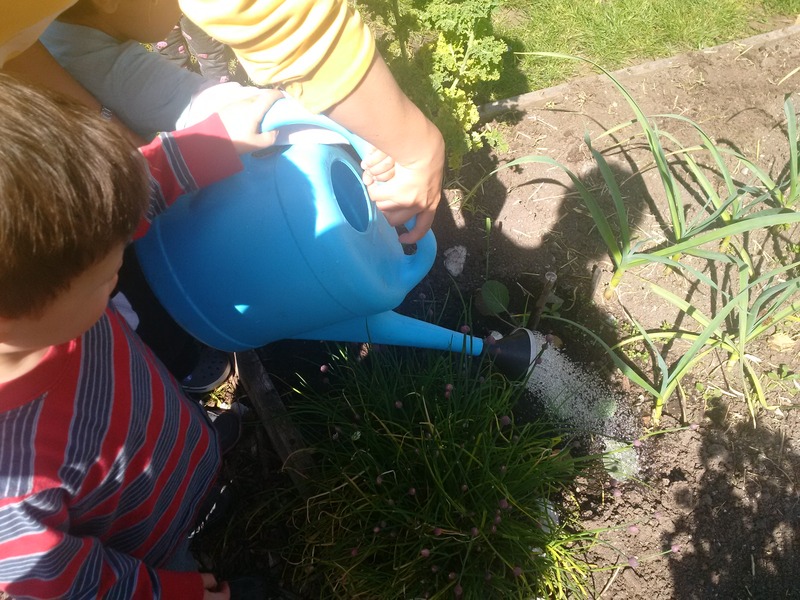 The Mount Pleasant Family Centre has created a gardening workshop through the summer until September running once a week. This was created for local families who either don’t have access to a garden or want to learn more about gardening indoors and outdoors. 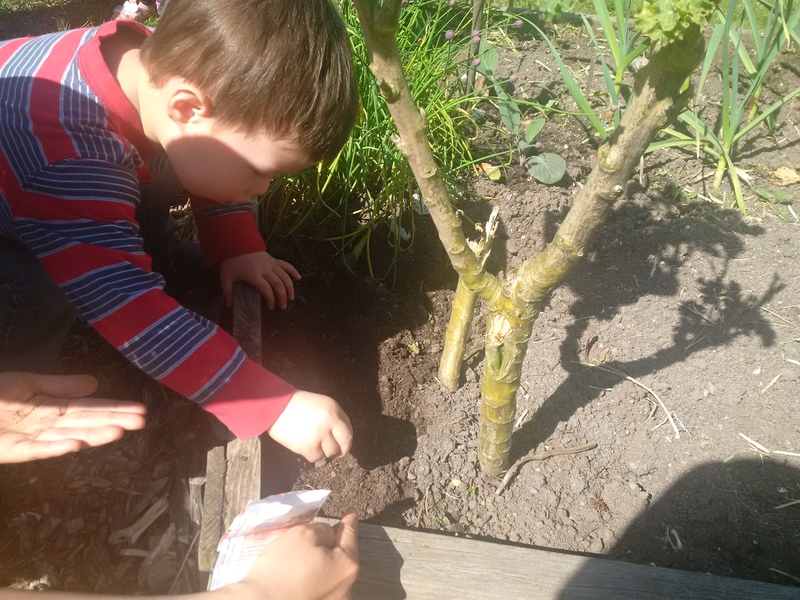 The program is run by a licensed Early Childhood Educator who has created gardens for children across Vancouver in the hopes of inspiring families to spend more time outside in nature while growing their own food. The families take on the responsibility of weeding, watering and planting during the weeks they are registered, and are rewarded by taking their harvest home at the end of the growing season! Seeds were donated by The Food Connection from their March gardening workshop and seed swap. 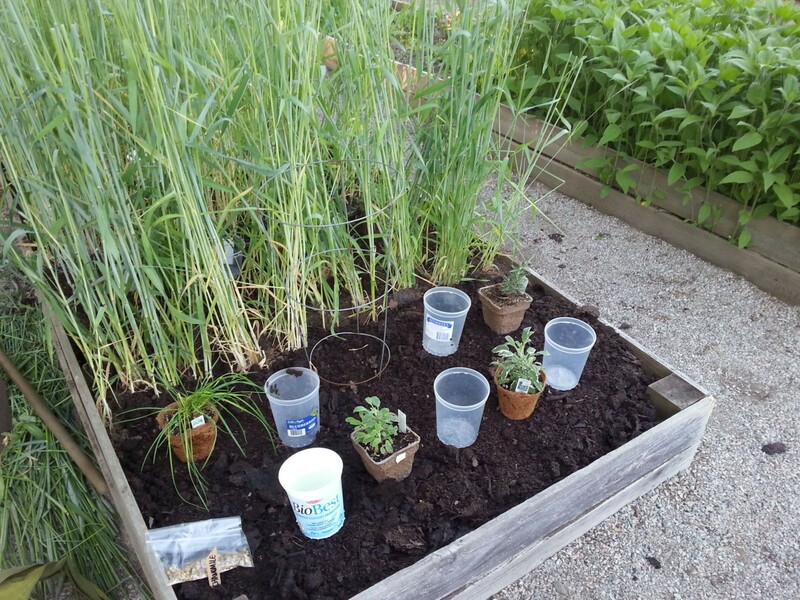 So far, the families have planted radishes, carrots and a wildlflower blend that bees and butterflies are attracted to — and they’re all sprouting! The Mount Pleasant Family Centre provides child-centred programs that nurture healthy growth and development for all families: ‘A Home Away From Home’. We’re glad they’re part of the Mount Pleasant Food Network! Are you curious about how to identify, pick and eat wild foods? Our friends at MuseumEats present a fascinating Wildcrafting Weekend Intensive for folks who want to learn more about wild foods as medicine, food and art! The workshop series will kick off with a Wildcrafting Potluck hosted by The Food Connection on April 27th. Please RSVP. Bring your foraged food and art, as well as stories and questions you have about the wild! In light of its ethics of holism and community, MuseumEats has expanded its focus beyond food collection and recruited some talented and inspiring facilitators for a Wildcrafting Weekend Intensive from April 29-May 1. This weekend will not only include education about what/how/why to pick wild foods, but will also touch on Weaving with Native and Foraged Materials, Plant-Spirit Medicine, Aromatherapy, and Wild Dynamic Permaculture. Under the guidance of Camille Flanjak, Bea Edelstein, Kelly Ablard, and Lori Snyder, we’ll be identifying and collecting wild mushrooms, greens, shoots, and bushes for food, craft, and medicine, and learning how the integration of people into natural wild systems is more efficient than mono-crop agriculture. Join us for an awesome and intense weekend of wildness! MuseumEats is an organization that aims to build community and the connection between source and stomach. We conduct private and pubic foraging (wildcrafting) workshops with a holistic perspective: from sustainability and permaculture, to hipster food-ism and plant spirit medicine. Camille Flanjak started facilitating MuseumEats Wildcrafting Workshops to meld her 2 biggest passions: food security and her voracious palate. Find her in the woods drinking Coenobium and putting plants in her mouth. What connection do you see between your identity, as an individual, or community and consumption of your traditional foods? What are some of the benefits you see when you connect with others around your traditional foods? How do you address the ethical balance between your desire to consume your traditional foods with issues around access, availability and environmental sustainability? These are some of the questions posed in Cooking Across Cultures: Ingredients for Wellness and Belonging. Filming began in spring of 2015 with the intention of examining the healthy immigrant effect. The Healthy Immigrant Effect is the notion that when newcomers and immigrants arrive in Canada, they are healthier than the average Canadian, but after 5 to 10 years of being in Canada their health decreases to match the average Canadian or lower. While there are other possible determinants of health that influence the decline of newcomers’ health over time, such as physical activity, economic status, education and others. Film makers were curious about the relationship of food and health in maintaining newcomers’ health. Participants from four different cultures share their experiences around their traditional foods and how this relationship has changed since settling in Vancouver. In the video we learn from representatives from Haida Gwaii and Tsimshian Territory; Lima, Peru; Osaka and Kanazawa Japan; and Kabul, Afghanistan about their struggles maintaining and adapting consumption of their traditional foods. The project took a participatory approach and encouraged participants to share stories about traditional food customs, cultural connections and nutritional habits from their homes. In a multicultural setting, participants shared ideas and recipes around cooking, preserving methods and challenges in accessing traditional foods. 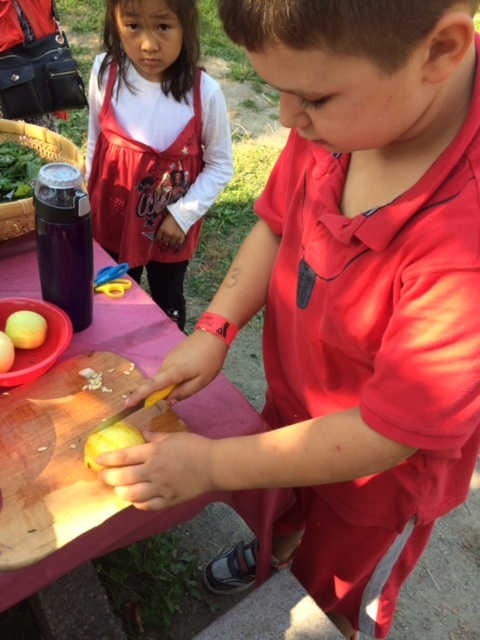 Cooking Across Cultures; Ingredients for Wellness and Belonging was produced by Mount Pleasant Neighbourhood House and funded by Decoda Literacy Solutions. Filming was done during Multicultural Cooking Clubs, funded by Citizenship and Immigration Canada. 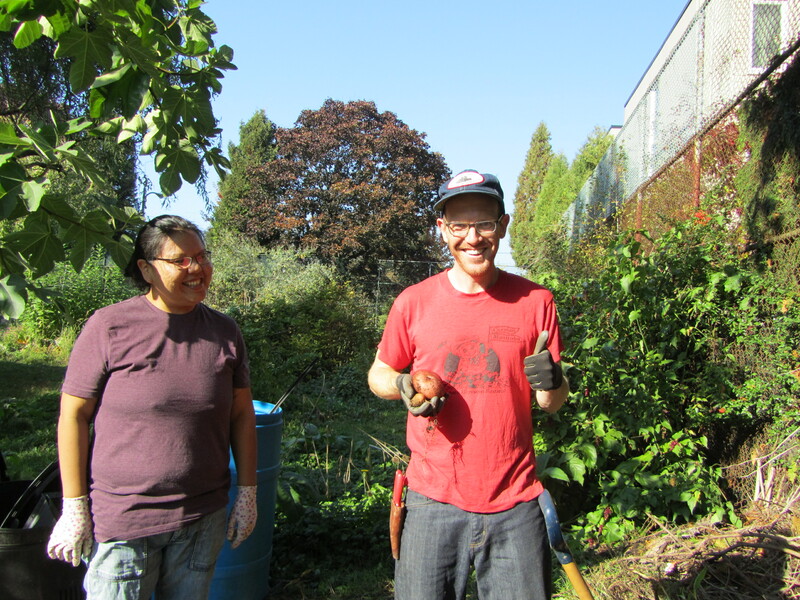 Many thanks are given to partners supporting food network and food justice work; Mount Pleasant Food Network, City of Vancouver, UBC School of Social Work, and United Way of the Lower Mainland. Special thanks are extended to Oka Community Planning and Visual Communications for the countless hours of in-kind support. This video was filmed on Unceded Musqueam Traditional Territory. Have you ever thought about how food is one of the things we all consume, every day, all over our city? Our culinary rituals carry histories and connect us to the people in our lives and the places we are from. It is our common denominator and we want to talk with you about it. Over a kitchen table we want to develop a book of portraits, stories and recipes primarily from sen­iors living in the Mt Pleasant neighbourhood. We are interested in your stories of family, ancestry and migration and the ways that food connects you to these places and memories. We’d love to spend some time in the kitchen cooking with you (or with your instruction!) and listening to your stories. We would also like to include young people living in Mt Pleasant and we are keen to have them recall recipes they might have inherited from older generations and the kinds of memories and associa­tions that come with the sharing of that food. These conversations and cook-ups will culminate in a photo exhibit and food celebration in November, funded by a Neighbourhood Small Grant from the Vancouver Foundation. We are Kerria, Sarah, & Elanna. Kerria is a photographer, teacher, and M.Education student, Sarah is a creative mapper and Elanna is a PhD student studying migration. We are all zealous cooks, canners & bakers. Kerria grew up in Vancouver, Sarah in Norway, and Elanna in Australia. Our own families are spread out all over, and like so many others our connections are far-reaching. We are now all firmly planted and love living in Mount Pleasant. We hope that through this project we can highlight the ways that for many, inter-generational connections can become stretched, and that sharing food and stories can keep those connections alive and strong. Our two main purposes with this project are to hear and share the diverse stories of food and connection in Mount Pleasant and, secondly, to connect young people and seniors in the neighbor­hood. We hope to have local young people take on an active role in the project and develop lasting inter-generational connections with other members of their community. What will be the outcome of the project? After a summer of shared conversations, coffees, and kitchen cook-ups the project will culminate in a community exhibition in November at the Mt Pleasant Neighbourhood House. At this event we will reveal photographic portraits of the all the participants involved in the project, snippets from the stories participants have shared, and share a community feast. Following the exhibition we will begin to put together a cookbook featuring seniors from Mt Pleasant, their stories, recipes, and portraits. We hope to publish and sell this cookbook, with the proceeds going toward the Mt Pleasant Neighbourhood House. How often and where would we get together? Ideally we could meet once every three weeks for a couple of hours, either at your home, at the Mt Pleasant Neighbourhood House, or another place of your choosing. We would hope to continue meeting until November. We will also be at Mt Pleasant Neighbourhood house every second Tuesday afternoon and will have coffee and cookies at the ready! We will be available to share updates on the project and introduce you to other folks involved in the project. What do you cook when family comes to visit? What are the foods that were or continue to be special to you, that were/are made on special occasions, or on any old day? What are the tastes and flavours that remind of home, your childhood, or another place? What are some of the foods or flavours that you miss, or that remind you of family or home? Is food part of celebration or other rituals for you? Do you have a migration story or a story of home that you’d like to share? 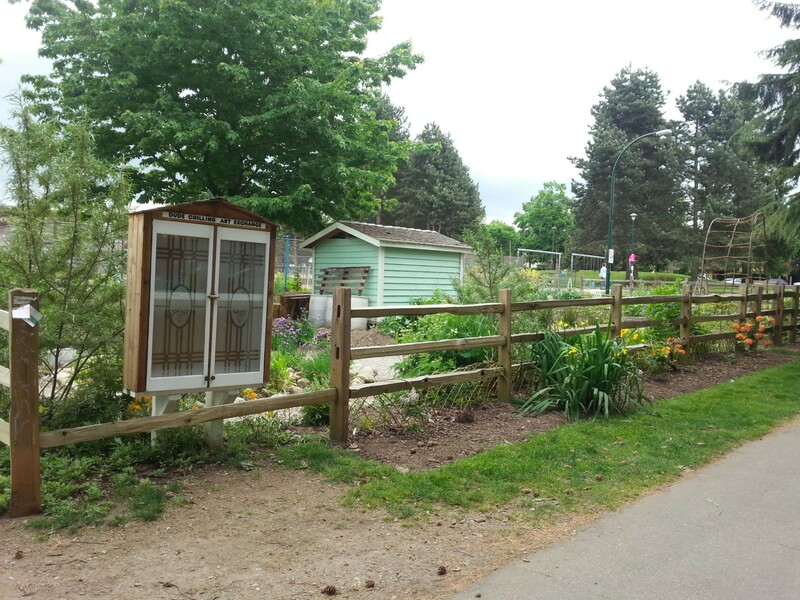 Nestled between Mount Pleasant Elementary School and Guelph Park — better known among locals as Dude Chilling Park — is one of East Vancouver’s hidden ecosystems: the Brewery Creek Community Garden. This thriving green space on East 7th Avenue is cushioned from the noise and traffic of the Broadway and Kingsway corridors. It’s a place where you’re likely to hear the sounds of kids making the most of recess, people playing tennis, birds singing, and folks of all stripes enjoying the urban outdoors. This is where we are rising to the challenges of tending a community garden plot, for Mount Pleasant Neighbourhood House and The Food Connection. We have a dream location with full sun exposure, and we’ve done plenty of experimenting to learn what food will thrive in these growing conditions. 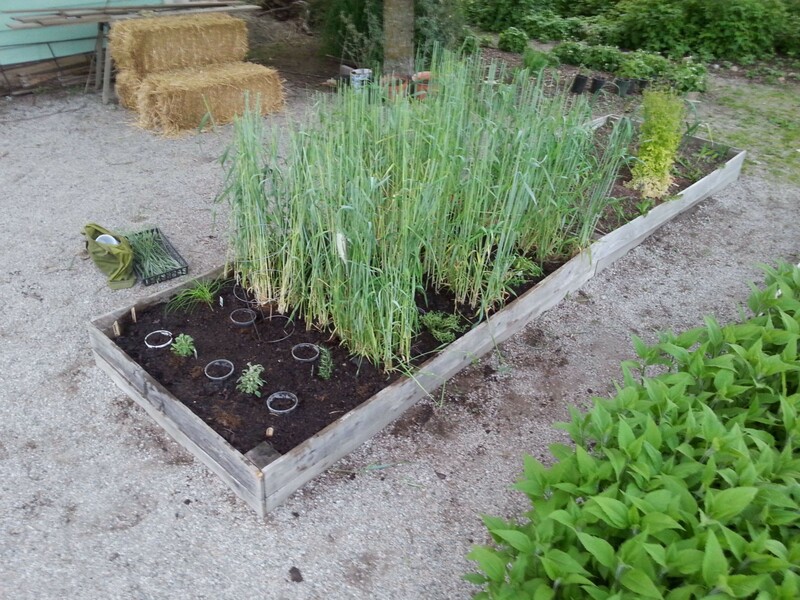 This year we’ve decided to create an herb garden, which will provide fresh ingredients for the many types of free food workshops we offer at the Neighbourhood House. We’re choosing perennial plants that will grow for many months, return year after year, and support sustained harvesting. We also want to do our part to help conserve water. 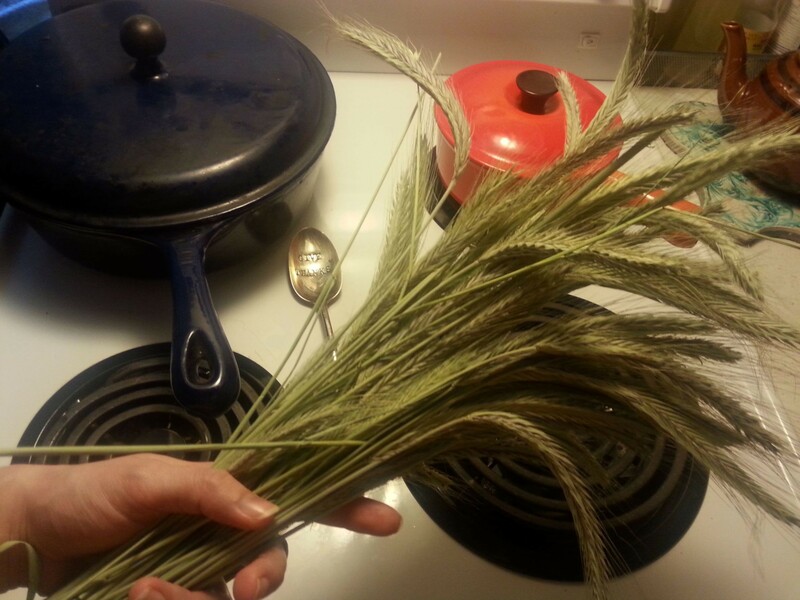 To our surprise, the first thing that really takes off is wheat, which grows tall and sturdy through early spring. Our crop will be too small to produce flour, so today we harvest just the grains while the plants are still green. The young wheat grains are called freekeh, and they pack a nutritious punch. We’ll toast the freekeh, and add it to salads for a crunchy texture and nutty flavour. In the early evening, people are dropping by to water their own garden plots, and one woman asks if I’m watering the wheat. I show her how the stalks are perfect for transplanting to create row dividers and shade. Their roots will also help to hold soil and water for a happy garden. Next, we’re ready for the yogurt pots we’ve saved up over the winter. They’re made from #5 plastic, making them reusable without emitting chemicals into food. We’ve already poked the bottoms full of holes, and now we fill them with dirt. We space them evenly through the garden, then sink them into the ground, leaving the brims showing. 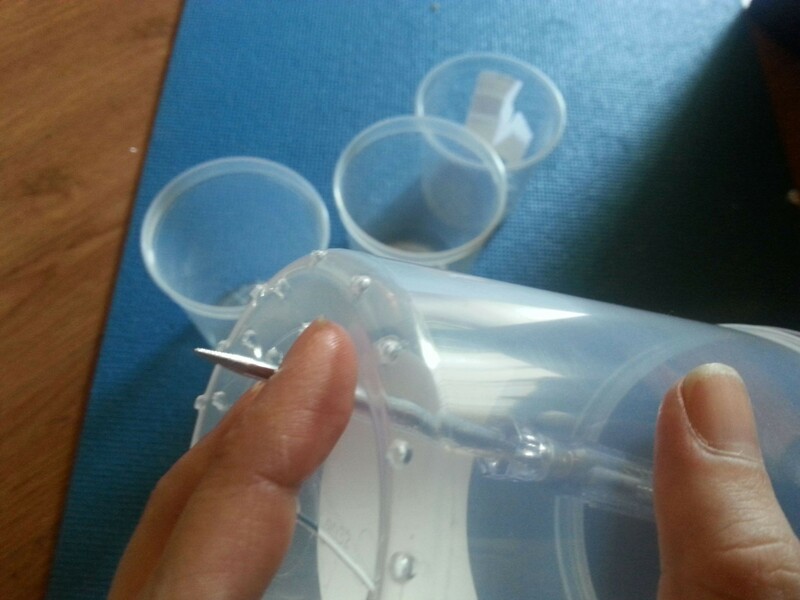 Each time we water the garden, we’ll fill up these little reservoirs, which will distribute water to our plants’ roots, keeping the soil moist even in the heat of summer. A few members of the Little Diggers Gardening Club come by to check on the progress of their garden patch. They find their own plants by reading names aloud, and compare their growth against their friends’ seedlings. 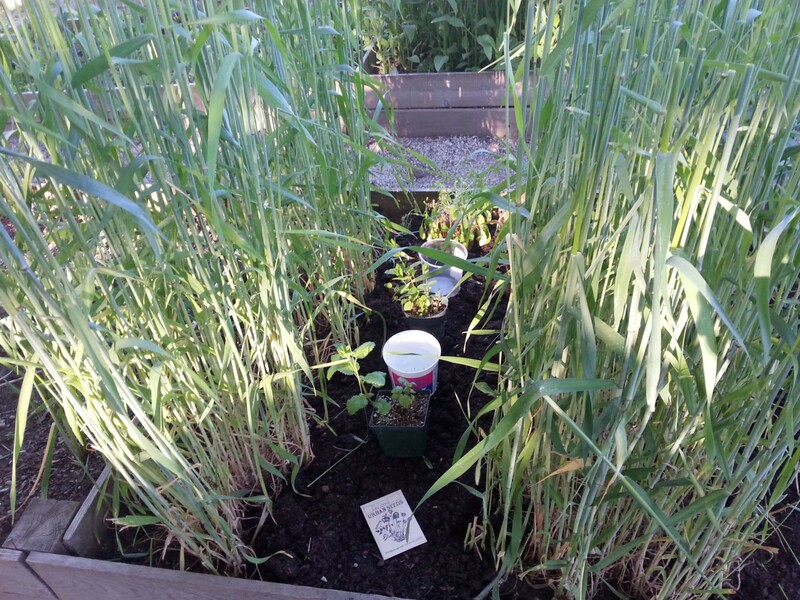 Back in our own plot, we’re ready to plant the fragrant seedlings we selected during this year’s Stone Soup Festival. We also plant seeds we’ve saved from our home gardens, like nasturtium and calendula. Then we scatter some red clover seeds for ground cover that will attract pollinators and beneficial insects. With my hands in the dirt, I chat with people who are searching the grounds for ideas to bring home with them, or taking photos of plants they want to learn about and identify. I’m excited to tell them about our plans for the food we’re growing. For our juicy chicken workshop later this month, we’ll be ready to pick thyme, chives, rosemary, and sage. When summer is in full swing, we’ll hand-select leaves of mint, lemon balm, and chamomile to create garden cocktails with our own naturally fermented sodas. 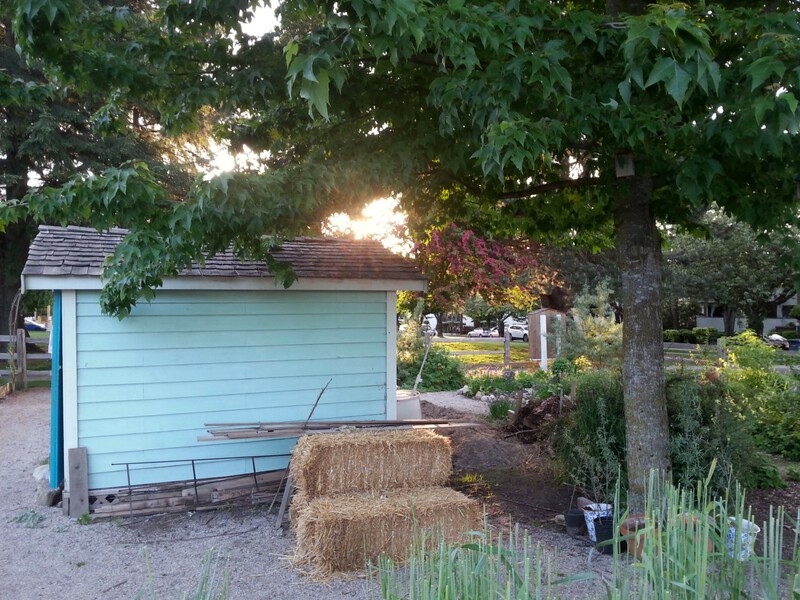 We finish the day’s work by putting rakes, shovels, and watering cans back into the shed, surveying this pocket of fertile land, and leaving at sundown with a sense of satisfaction and anticipation. Thank you to Skipper Otto’s and all of your amazing Members!!!! Since 2009 Skipper Otto’s has had the tradition of donating unused shares to community organizations in need of food donations. In the past they’ve have donated to the Vancouver Food Bank Food Runners, and to several private, low-income families. Last fall Skipper Otto’s invited their members to join them in making donations to Mount Pleasant Neighborhood House. Mount Pleasant Neighborhood House (MPNH) offers diverse programming near the Broadway and Fraser area of Mount Pleasant providing much needed services to a broad range of community members from babies through to seniors as well as providing specific programming to Aboriginals and Immigrant participants. 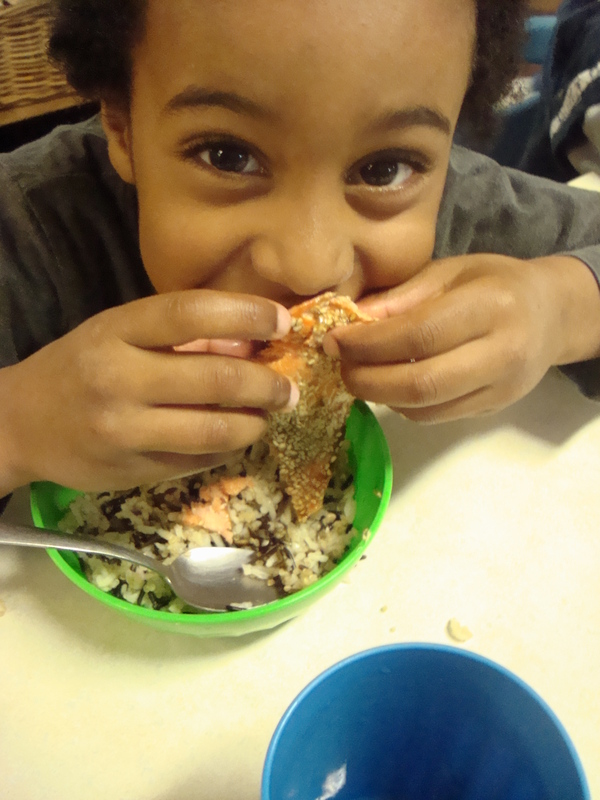 In one month they were able to raise enough money for over 100 pounds of fresh fish!!! These donations of healthy, sustainable, quality fish are going towards numerous programs at the MPNH including the Mount Pleasant Food Network, which seeks to strengthen food systems in Mount Pleasant. The fish will also go towards providing lunches and snacks for children in daycare, lunches for seniors and meals for community and cultural events. 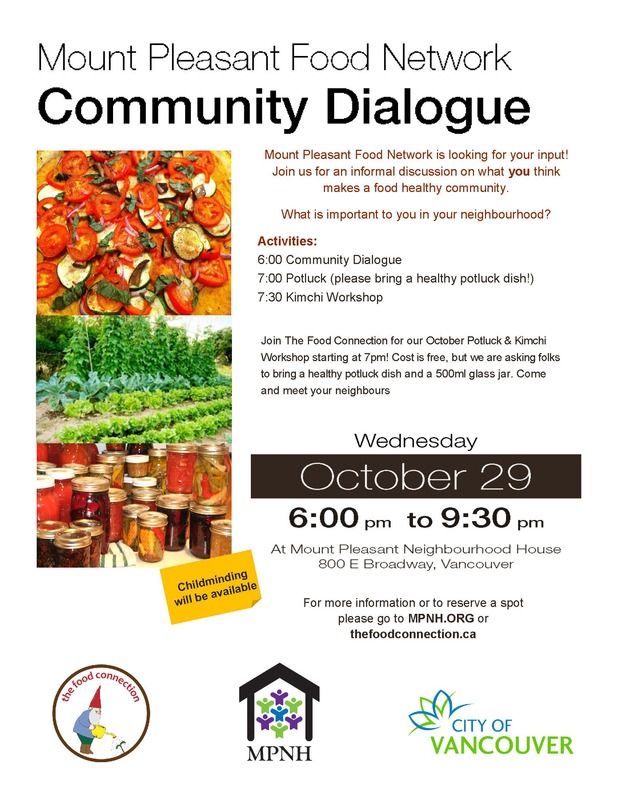 Join us at Mount Pleasant Neighbourhood House on October 29th for an informal dialogue about the MPFN. We will be introducing the MPFN to community members and are looking for input for our Food Asset Mapping Project. The workshop will be from 6-7pm, followed by a potluck and a kimchi workshop. Please follow the link to rsvp. Contact Andrew Hunter for more information. Join the Food Connection this month for a celebration of local seasonal food! They’re throwing a party with food, music and FUN so bring your friends & family! Come play with food at their various experimentation stations and learn different ways to devour your favourite seasonal foods! 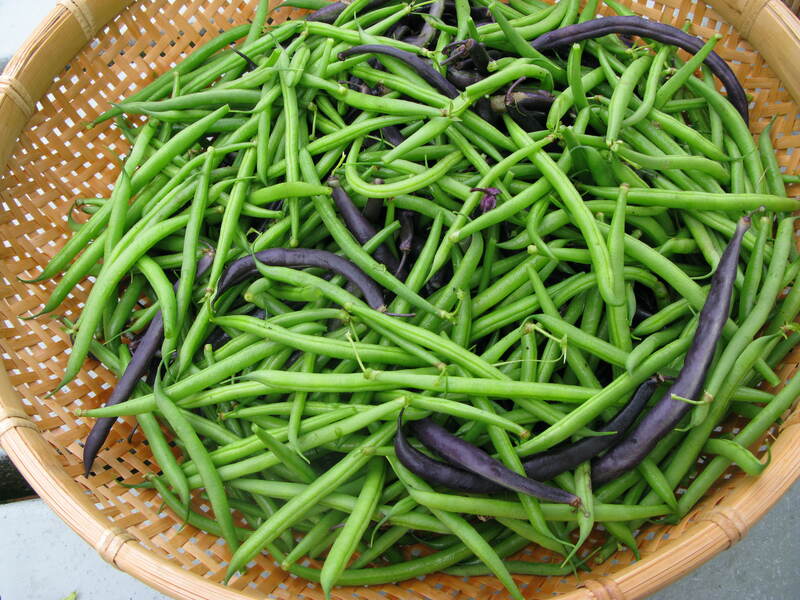 They’re encouraging folks to bring any local seasonal fruits & veggies or other ingredients they can offer. There will be four food stations you can contribute to: soup, salad, flatbread (pizza), and blended ‘ice cream’ dessert. Suggested ingredients are listed on their RSVP form. CLICK HERE to sign up for the event and to let them know what you’re bringing. Please RSVP by September 20. They’re also inviting people to help out or play music during the event, so if you’re interested, let them know on the form!